AV-8B Harriers operating in Afghanistan. Image from the US Department of Defense. Friday night’s “well-coordinated” suicide assault on Camp Bastion resulted in the destruction of six US Harrier strike aircraft and significant damage to two others. The members of the suicide assault team wore US Army uniforms and “appeared to be well equipped, trained and rehearsed,” the International Security Assistance Force said. The nighttime attack, in which a suicide assault team penetrated the perimeter of Camp Bastion, a sprawling base in the Desert of Death in Helmand province, resulted in the death of two ISAF soldiers. Eight other ISAF troops and a civilian contractor were wounded in the attack. Fourteen members of the assault team were killed and one more was wounded and captured. 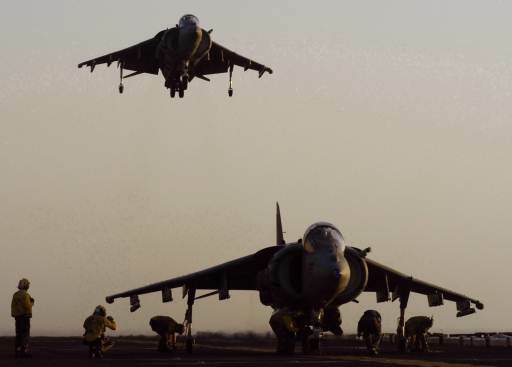 ISAF confirmed that six AV-8B Harrier strike aircraft “were destroyed” and two more “were significantly damaged.” Although ISAF did not state which country owned flew the aircraft, the US Marine Corps is the only military branch flying Harriers in Afghanistan. The aircraft cost an estimated $30 million each. However, a US Marine aviation officer familiar with operations in southern Afghanistan disagreed. The Harriers are used to provide close air support for Coalition forces conducting combat and counterinsurgency operations in the south, and with eight of the aircraft taken offline, there will be less to support these missions. Correction/update: the article was updated to note that the Harriers were from the US Marine Corps. The British military retired its Harriers two years ago. In the past, Harriers were stationed in Afghanistan.